X Its cry leaves a lasting headache if heard for too long. It moves so quickly that it is almost invisible. X Sein Gesang erzeugt unausweichlich Kopfweh. Es bewegt sich so schnell, dass es beinah unsichtbar zu sein scheint. X C’est la migraine assurée quand il pousse son cri perçant. On le perd facilement de vue tant il est vif. X Escuchar su zumbido de forma continuada provoca jaquecas. Casi no se le ve de lo rápido que es. X I suoi continui lamenti provocano atroci emicranie. Si sposta così velocemente che... non si vede! X 울음소리를 계속 들으면 두통이 낫지 않게 된다. 안 보일 정도의 스피드로 움직인다. Y Because it moves so quickly, it sometimes becomes unseeable. It congregates around tree sap. Y Es bewegt sich so schnell, dass es manchmal unsichtbar zu sein scheint. Es liebt Baumsaft. Y Il bouge si vite que l’œil a parfois du mal à le suivre. Les Pokémon de cette espèce se regroupent près de la sève des arbres. Y Se mueve tan rápido que a veces resulta invisible. Le atrae la savia de los árboles. Y Si muove così in fretta da risultare quasi invisibile. Lo si vede in gruppo attorno agli alberi ricchi di linfa. Y 매우 고속으로 움직이므로 모습이 보이지 않게 될 때가 있다. 수액에 모여든다. 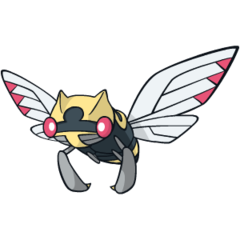 Omega Ruby If Ninjask is not trained properly, it will refuse to obey the Trainer and cry loudly continuously. Because of this quality, this Pokémon is said to be one that puts the Trainer’s abilities to the test. Omega Ruby Wenn Ninjask nicht richtig trainiert wird, hört es nicht mehr auf seinen Trainer und beginnt, unaufhörlich und laut zu brüllen. Es stellt die Fähigkeiten eines Trainers auf eine harte Probe. 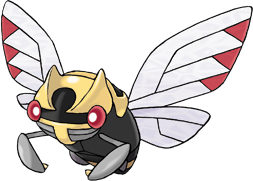 Omega Ruby Si Ninjask n’est pas dressé correctement, il refuse d’obéir à son Dresseur et crie sans arrêt. C’est pourquoi on dit que ce Pokémon peut réellement mettre son Dresseur à l’épreuve. Omega Ruby Si Ninjask no recibe un entrenamiento adecuado, desobedece a su Entrenador y empieza a dar zumbidos sin parar. Por ello, se dice que pone a prueba las habilidades de su Entrenador. Omega Ruby Se Ninjask non viene allenato adeguatamente, si rifiuta di obbedire all’Allenatore, lamentandosi di continuo. Questa sua caratteristica mette alla prova le capacità di ciascun Allenatore di Pokémon. Omega Ruby 잘 키우지 않으면 말을 듣지 않고 큰 소리로 계속 울어대기 때문에 트레이너의 실력이 시험되는 포켓몬이라고 전해진다. Alpha Sapphire Ninjask moves around at such a high speed that it cannot be seen, even while its crying can be clearly heard. For that reason, this Pokémon was long believed to be invisible. Alpha Sapphire Ninjask bewegt sich so schnell, dass man es nicht sehen kann. Seine Schreie sind aber laut und deutlich zu hören. Deshalb hielt man dieses Pokémon lange für unsichtbar. Alpha Sapphire Ninjask se déplace tellement vite qu’il est impossible de le voir. En revanche, on entend clairement son cri. On a pendant très longtemps cru que ce Pokémon était invisible. Alpha Sapphire Ninjask se mueve de un lado a otro a tal velocidad que es imposible verlo. Sin embargo, como su zumbido no deja de oírse, se pensó durante mucho tiempo que este Pokémon era invisible. Alpha Sapphire Ninjask si muove a una velocità tale da rendersi praticamente invisibile, nonostante il suo verso si possa udire chiaramente. Per questo motivo, per molto tempo si è pensato che fosse effettivamente invisibile. Alpha Sapphire 고속으로 움직여서 모습이 보이지 않는다. 울음소리만 들려서 오랫동안 투명한 포켓몬이라고 여겨져 왔다. Ruby Ninjask moves around at such a high speed that it cannot be seen, even while its cry can be clearly heard. For that reason, this Pokemon was long believed to be invisible. Sapphire If NINJASK is not trained properly, it will refuse to obey the TRAINER and cry loudly continuously. Because of this quality, this POKeMON is said to be one that puts the TRAINER's abilities to the test. FireRed This POKeMON is so quick, it is said to be able to avoid any attack. It loves to feed on tree sap. LeafGreen This POKeMON is so quick, it is said to be able to avoid any attack. It loves to feed on tree sap. Emerald Because it darts about vigorously at high speed, it is very difficult to see. Hearing its distinctive cries for too long induces a headache. Diamond Because it moves so quickly, it sometimes becomes unseeable. It congregates around tree sap. Pearl Because it moves so quickly, it sometimes becomes unseeable. It congregates around tree sap. Platinum Because it moves so quickly, it sometimes becomes unseeable. It congregates around tree sap. HeartGold Its cry leaves a lasting headache if heard for too long. It moves so quickly that it is almost invisible. SoulSilver Its cry leaves a lasting headache if heard for too long. It moves so quickly that it is almost invisible. Black Because it moves so quickly, it sometimes becomes unseeable. It congregates around tree sap. White Because it moves so quickly, it sometimes becomes unseeable. It congregates around tree sap. Black 2 Because it moves so quickly, it sometimes becomes unseeable. It congregates around tree sap. White 2 Because it moves so quickly, it sometimes becomes unseeable. It congregates around tree sap.